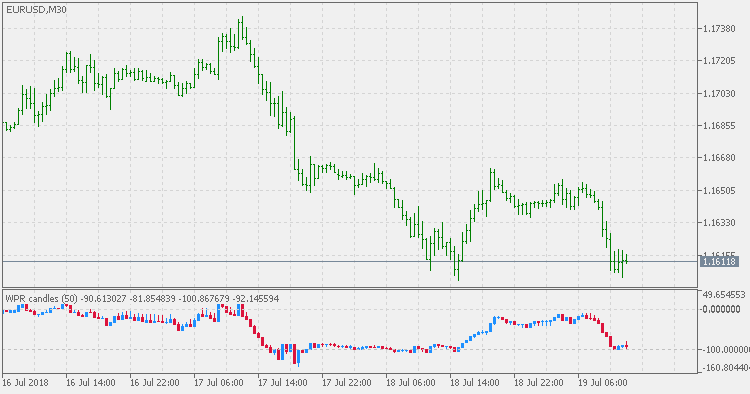 This indicator is a variation of a well known WPR (Williams Percent Range) indicator. Those 4 values are then combined into "candles". The calculation is not using the original WPR calculation. Instead it is adjusted to be able to calculate these 4 values. As a result 2 significant levels are now available. Level 0 (which unlike the original WPR, can be crossed up in this version). Level -100 (which unlike the original WPR, can be crossed down in this version). That way, by observing the levels, possible overbought and oversold states can be assessed. Instead of using "raw" prices" for calculations, Heiken Ashi Smoothed indicator is using smoothed/filtered/averaged prices instead.